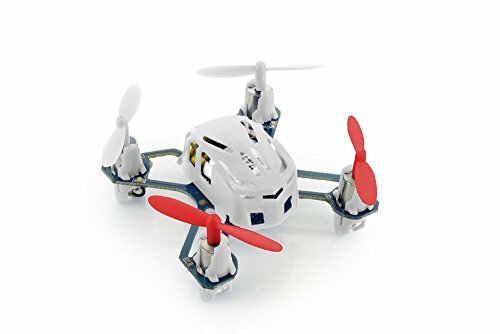 360° Eversion - 4 Way Flipping (Left, Right, Forward & Backward), continuous roll for perfect action and wonderful performance - have fun flipping and doing tricks with the mini quadcopter! Colorful Flashing Lights - Play with this versatile quadcopter during the day or at night! Flashing lights make it just as fun to play in the dark! World's Smallest Quadcopter! Very small in size, but packs power for very fun flights! Small and lightweight making it easy for flips and flights. Fun to play with friends, kids, family, and even pets! Remote control: 2.4GHz radio control. Battery for the quadcopter: 1 x 3.7V 100mAh rechargeable Lipo battery (included). Charging time: about 25-30 minutes. Flight time: about 5 minutes. Battery for the remote controller: 2 x 1.5V AAA batteries (not included). Remote control range: about 50 meters.